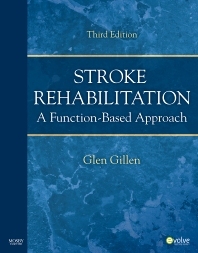 Gillen's Stroke Rehabilitation: A Function-Based Approach, 3rd Edition is the only comprehensive, evidence-based stroke rehabilitation resource for occupational therapists. Extensively updated with the latest research in assessment and intervention, this essential text presents a holistic, application-based approach that integrates background medical information, samples of functionally based evaluations, and current treatment techniques and intervention strategies to help you confidently manage the growing number of stroke rehabilitation clients. UNIQUE! Case studies challenge you to apply rehabilitation concepts to realistic scenarios. Evidence-based clinical trials and outcome studies clearly outline the basis for stroke interventions. UNIQUE! Survivor's Perspectives help you understand the stroke rehabilitation process from the client's point-of-view. UNIQUE! A multidisciplinary approach highlights discipline-specific distinctions in stroke rehabilitation among occupation and physical therapists, physicians, and speech-language pathologists. Review questions in each chapter help you assess your understanding of rehabilitation concepts. Key terms and chapter objectives at the beginning of each chapter help you study more efficiently. 11. Rehabilitation Technologies to Promote Upper Limb Recovery after Stroke NEW! 19. Treatment of Cognitive-Perceptual Deficits: A Function-Based Approach NEW! 20. Managing Speech and Language Deficits after Stroke NEW!